Every October we teach a course in marine biodiversity. Being a practical course we are based at a suitable location at the island Hitra and use the research vessel “Gunnerus” to work from. Students are assigned tasks making them qualified to sample and prepare organisms, organise data and present their results. The course “Marine biodiversity” is arranged following the same scheme every year, with minor adjustments considering techniques and tasks if necessary. This year 20 students followed the course. Arriving at Hitra Monday night we realised that the following days would be challenging as the weather forecast was not the best. Tuesday morning gale force wind increasing to full storm left “Gunnerus” docked and we had to improvise. It turned out to be almost three days with studies and tasks focusing on the littoral zone. Luckily Wednesday evening “Gunnerus” was able to take some students on ROV operations. The rest of us were still forced to study the littoral. Local floating stages were used to find organisms and we always find something interesting. Nudibranchs are among the organisms students find fascinating. We found several species we can use in our research. 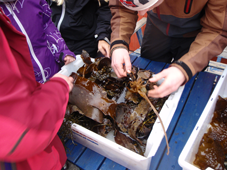 Thursday went on as planned with kelp forest studies and some students trawling for fish with “Gunnerus”. Friday was used for preparation of results on the return home.